I have no doubt that a major contributing factor to Kinder Morgan’s decision was the strength of its opposition, formed by a broad-based coalition of ordinary citizens fighting for the safety of their communities, to protect public lands, and to exercise their private property rights by preventing the seizure of their land through eminent domain. I have been a vocal opponent of the project both in my capacity as a state legislator and as a private citizen, urging my constituents and other residents of the Merrimack Valley to attend public hearings and submit comments. In November, I testified before a legislative committee in opposition to a bill that would have allowed Kinder Morgan to run their pipeline through over 100 parcels of constitutionally protected land. Our state has committed major public resources—over $360 million for land conservation in the past seven years alone—in order to protect natural habitats and precious water quality. If the legislation had been successful, almost 30 acres would have been permanently impacted for the transport of fracked natural gas, and one million gallons of water would have been drawn from a pond in the Otis State Forest to test the pipeline. Just days prior to Kinder Morgan’s announcement that they were suspending the project, I attended and spoke at a hearing in Dracut where the state Department of Public Utilities (DPU) was gathering testimony related to a Kinder Morgan petition to force private landowners to allow the company to conduct land surveys on their property. In total, over 400 property owners in Massachusetts, including 35 in Methuen, received and refused requests by the company to survey their land as potential sites to dig up and install the pipeline. Residents did not want to give permission for the company to enter their properties for various reasons, whether out of concern for their future home values, in order to protect costly landscaping, or for the safety of their families. By all accounts, those families were justified in their concerns. Between 1994 and 2013, Kinder Morgan experienced 745 “serious incidents” with their gas distribution network, which resulted in multiple fatalities, 1,059 injuries, and $110 million in property damage. One of these incidents occurred in December 2011 and involved a natural gas pipeline that was just two-years old, which leaked in a residential area of Ohio, spewing 127,000 cubic feet of natural gas and forcing residents to evacuate their homes. In 2011 alone, Kinder Morgan was cited on five separate occasions by the Hazardous Materials Safety Administration for violating its safety protocols. Massachusetts Department of Public Utilities to permit charging ratepayers for pipeline expansions. That court hearing is anticipated on May 5, and will impact whether the cost of other pipelines proposed for construction can be charged to ratepayers. This story has a positive ending. Much of that was on account of the vigilant and focused residents from across the Commonwealth that spoke up against a bad deal. The costs and risks were simply too great for Massachusetts’ residents and ratepayers to bear on behalf of private corporate interests in the name of increased natural gas capacity destined for foreign export. We must continue that level of scrutiny with each major energy proposal. 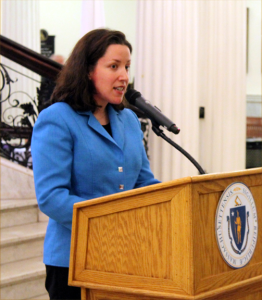 With this proposal behind us, I look forward to having a more comprehensive discussion about Massachusetts’ current and future energy needs, while growing conservation efforts and expanding our renewable energy portfolio. Senator O’Connor Ives can be reached at KATHLEEN.OCONNORIVES@MASENATE.GOV .